I suppose the most honest way I can start is by admitting it out right- I have a lot of feelings about the Henriad. 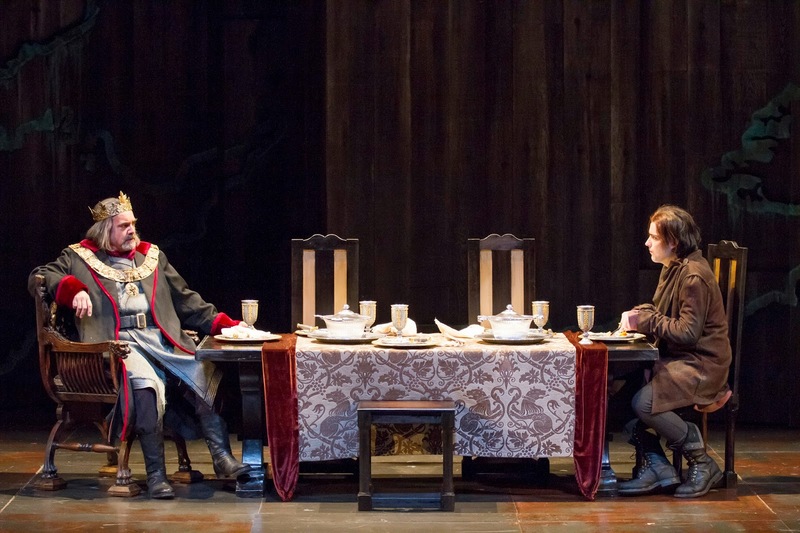 For one thing, I'm pretentious enough to call it "The Henriad"*, and have read and written more about the two parts of Henry IV (now open in repertory at the Shakespeare Theatre Company) than any one person should. Know this, because it means that I am a history play snob- they are my favorite plays in the canon and I won't hear a word said against them. But please also know that I walked into the Harmon on Tuesday night wearing a button on my lapel that read "Hal's Angels. "** Know this, because I am what we call on the internet a "fangirl." I have very definite ideas about what I want in a Henry IV Part 1, which makes me both peculiar (how many laypeople do YOU know with strong opinions on 1H4?) and a tricky audience member. When you care this much (and started forming Strong Opinions when you were still a teenager), it can be hard to let go and be open to someone else's interpretation, even when that person is the estimable Michael Kahn. On Tuesday night, ten minutes before curtain, I stood in the lobby of Harman Hall. I leveled the statue of Michael Kahn that adorns that lobby with a good, long look, one that hopefully conveyed to the inanimate object that I'd be watching- closely- to make sure he did right by my favorite play. I'm sure the statue appreciated it. Edward Gero as King Henry IV and Matthew Amendt as Prince Hal in the Shakespeare Theatre Company production of Henry IV, Part 1, directed by Michael Kahn. Photo by Scott Suchman. Michael Kahn has said that these two plays are perhaps his favorite in the canon, and there's a lot that demonstrates the care with which he regards them. Without going into to much detail, these two plays (a review of Henry IV Part Two will follow here in a few days) are part of a sequence that began with Richard II and will end in Henry V. The events of Richard II, and the ignoble death of that king that allowed Henry IV to take his throne, weigh heavily upon Henry and his son, and it's Richard's words on the divine right of kings that begin the evening in Kahn's production. That knowledge- both of where we've come from and where we're going- are the foundation of this production. We begin the evening by seeing how uneasy lies the head that wears the crown; the soliloquy that gives us those famous lines may not come until Part 2, but you can see all the weight and strain of King Henry's troubled reign in Edward Gero's shoulders as soon as the lights come up. Kahn's production milks all the tension in the rough, rude stage of an Eastcheap tavern when Stacy Keach's Falstaff begs poignantly not to be forgotten by Matthew Amendt's Prince Hal once h\e takes the throne. Not everyone in the Harmon has seen Henry IV Part Two yet, but no one is going to doubt that things somehow won't be ending well after that scene concludes. Everyone is going to be talking about Stacy Keach's Falstaff, so let me go ahead and jump right on that bandwagon. 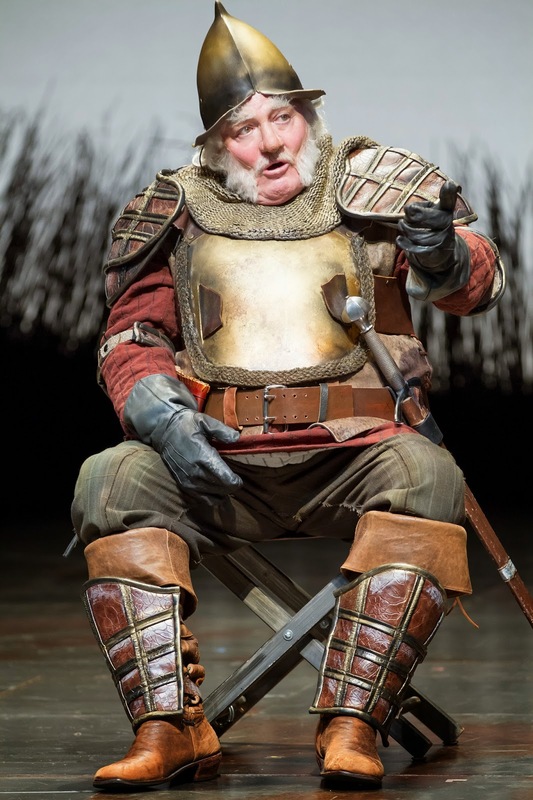 Keach is an actor of enormous intelligence and grace, and his Sweet Jack is imbued with melancholy and unlikely wisdom alongside the humor we come to expect from a Falstaff. If there's criticism to be found, actually, it's hidden in that last phrase: "what we expect from a Falstaff," because four hundred years on, we do have cultural expectations of this character. I have no criticisms of Keach's performance, but with how the production presents us with his character. At some point it was decreed that Falstaff must have the belly, the white hair, the beard; a Santa Claus who brings sack, sans toys. When Keach makes his entrance, we see exactly that image of the character. The problem with Ann Hould-Ward's costume design isn't its intricate accuracy- it's that it's so Falstaffian that the image it presents is a cartoon, rather than a human being. And that particular issue isn't particular to Falstaff; with several characters, there's a sense watching the production that we're seeing costume sketches come to life- the details of Hotspur's costume, in particular, fall prey to this tendency. I never lost sight of the costume qua costume during the entire production; there was never the strange alchemy of theatre when the characters become so real and recognizable that their costumes become their clothes. Stacy Keach as Falstaff in the Shakespeare Theatre Company production of Henry IV, Part 1, directed by Michael Kahn. Photo by Scott Suchman. In contrast to Falstaff, Matthew Amendt's Hal has more than a little hipster to him. He's slumming it in Eastcheap in his skinny jeans and artfully draped scarf, living the Augustinian dream of "Oh Lord, make me good, but not yet." Amendt has played Hal-as-Henry V with another company, prior to taking on the younger prince at STC, and that knowledge of the endgame informs his character choices here. His is a Hal that is primed for reformation, or at least as soon as he can be bothered to pull himself together. He's restless, intelligent, and not at all ready when news arrives that war is imminent, though we see him try his best. It's a pity that John Keabler's Hotspur fails to live up to the aura of excitement necessary to truly be a foil for Hal. His overly stylized costume doesn't help, but then even when he takes most of it off, we still don't see the excited, excitable warrior that has Henry IV rattled. Kahn has crafted some thoughtful and interesting choices around the tricky relationship between Hotspur and his wife (played by Kelly Curran), but Keabler's own choices are sculpted with rather less care than his abs. It's nice to see Derrick Lee Weeden featured in Part 1 as the Lord Chief Justice (complete with an ear-boxing straight out of The Famous Victories of Henry the Fifth), and I cheered to see Chris Genebach in the small role of Sir Richard Vernon (Hal's biggest fanboy, and thus the character with whom I most identify). I love having Steve Pickering back at STC (and I gleefully anticipate his Pistol in Part Two), and even if Ted van Griethuysen's wig looks more like a relic from a Pinterist photo shoot,*** it's a pleasure to see such a large cast filling the stage of the Harman, knowing that these actors will return in a repertory. Michael Kahn's production is a thoughtful one. It seems to want very much for the audience to feel the tide of history, how the choices we make return to haunt us, and how we can pass them and their consequences on after we leave. Falstaff shines brightly here, and we're called to witness the growing pains of a prince who was never supposed to have grow into a king. I could wish for a few things to be different- as lovely as Alexander Dodge's set becomes when it expands, there was a whole lot of earth tones and greys on that stage for two and a half hours. It's a sumptuously large cast- couldn't they have hung around a little more in the tavern scenes? Most of all, I wish I understood why we miss out on one of the great metatheatrical coups des theatres in the final act... but that's a grumble for another day. With a play that's so near to my heart, I worried before seeing this production that audiences would walk away without realizing why these plays are so special. We all have our darlings, and we want to protect them from scorn, disdain, or even worse- boredom. I don't need every audience member ready to declare Hal their new Shakespearean boyfriend (I've got the prior claim, after all), but I do want them to see why he matters so much to me. I believe this production accomplishes that. Until I direct the all-Hal, all singing and dancing spectacular version of the Henriad, I'll likely never see my perfect Henry IV. I'll always have some quibbles, and I'll always want to see choices that reflect my own interpretation of these texts, but in the meantime, I can point folks to the Harman and say- Go check this one out. Then let's talk again. As for me, I'm definitely looking forward to Part Two, which is a pretty nice place to be. *Henry V as the third play of the Henriad trilogy, with Richard II rounding out what's known as the second tetralogy OH GOD, I'LL STOP NOW. I'M SO SORRY. *** WHAT is going on with the wigs? Far too many of the men looked as though they had limp cats sprawling on their heads, even without the pink curls Glendower sports. I'm curious. I saw both installments, but I'm not as familiar with the plays as you are. What was the metatheatrical coup de theatre that we missed? It's the false death of Falstaff! Stage directions in Shakespeare are always questionable, since they tend to come from editors of several centuries ago, but we know that Falstaff is meant to be in a fight and then fall down as though dead. He's shamming, of course, but he stays down for a very long time, all through Hal's emotional, conflicted words over his body (which can be difficult to bear- what a JERK you are, Falstaff, how could you let your friend suffer like that?). Then, when the stage is his, up he pops, and reveals the ruse. What's wonderful here is when we don't know that Falstaff is faking his death. If he falls and we believe it, we enter into that space where we know an actor is alive, but accept that the character is dead. We watch the actor's chest rise and fall with breath, but do so knowing that the character is gone forever. We accept the illusion of death, knowing that when the lights go down, or another actor drags off the body, the actor will jump up and wander off backstage to their dressing room. There's a magical electricity when the false death is played convincingly, when an audience who doesn't know the plays sees Jack fall, sees the prince weeping over him when he most wants to tell him that he did the impossible and killed Hotspur. Because when Falstaff pops up, it plays with our suspension of disbelief in the most wonderful way- you didn't have to believe he was dead because the character was an actor, too. Someone in that audience won't have known he was faking, and you hear their reaction and it's genuinely thrilling. It's a gotcha moment, and it's a coup de theatre. I admit, I just don't see the point in not playing with that moment a little. Thanks. There's something very meta about that: knowing something about the play that at least part of the audience doesn't, and observing their reaction to the play as much as you observe the play itself.